1 M.2 2230; 1 M.2 2230/2280 1 M.2 slot for WLAN and 1 M.2 2230/2280 slot for storage. 1 Not all features are available in all editions or versions of Windows. Systems may require upgraded and/or separately purchased hardware, drivers, software or BIOS update to take full advantage of Windows functionality. Windows 10 is automatically updated, which is always enabled. ISP fees may apply and additional requirements may apply over time for updates. See http://www.windows.com/. 2 Some devices for academic use will automatically be updated to Windows 10 Pro Education with the Windows 10 Anniversary Update. Features vary; see https://aka.ms/ProEducation for Windows 10 Pro Education feature information. 3 Multi-core is designed to improve performance of certain software products. Not all customers or software applications will necessarily benefit from use of this technology. Performance and clock frequency will vary depending on application workload and your hardware and software configurations. AMD’s numbering is not a measurement of clock speed. 4 Native Miracast Support: is a wireless technology your PC can use to project your screen to TVs, projectors, and streaming. 5 HP Driver Packs: not preinstalled, however available for download at http://www.hp.com/go/clientmanagement 6 Multi-core is designed to improve performance of certain software products. Not all customers or software applications will necessarily benefit from use of this technology. Performance and clock frequency will vary depending on application workload and your hardware and software configurations. AMD’s numbering is not a measurement of clock speed. AMD and Radeon are trademarks of Advanced Micro Devices, Inc. 7 Burst frequency performance varies depending on hardware, software and overall system configuration. 8 NOTE: Your product does not support Windows 8 or Windows 7. In accordance with Microsoft’s support policy, HP does not support the Windows 8 or Windows 7 operating system on products configured with Intel® and AMD 7th generation and forward processors or provide any Windows 8 or Windows 7 drivers on http://www.support.hp.com 9 USB Antimicrobial Mouse: Not available in all regions; HP USB Hardened Mouse: Not available in all regions. 10 EPEAT® registered where applicable. EPEAT registration varies by country. See www.epeat.net for registration status by country. See HP’s 3rd party option store for solar energy accessory at www.hp.com/go/options. 11 External power supplies, power cords, cables and peripherals are not Low Halogen. Service parts obtained after purchase may not be Low Halogen. 12 Sold separately or as an optional feature. 13 (1) USB 3.1 Type-C™ Gen 2: Fast charging. 14 One 2.5" SATA HDD: Sold separately or as an optional feature. 15 HP Secure Erase: for the methods outlined in the National Institute of Standards and Technology Special Publication 800-88 "Clear" sanitation method. 16 Absolute Persistence module: Absolute agent is shipped turned off, and will be activated when customers activate a purchased subscription. Subscriptions can be purchased for terms ranging multiple years. Service is limited, check with Absolute for availability outside the U.S. The Absolute Recovery Guarantee is a limited warranty. Certain conditions apply. For full details visit: http://www.absolute.com/company/legal/agreements/computrace-agreement. Data Delete is an optional service provided by Absolute Software. If utilized, the Recovery Guarantee is null and void. In order to use the Data Delete service, customers must first sign a Pre-Authorization Agreement and either obtain a PIN or purchase one or more RSA SecurID tokens from Absolute Software. 17 HP Support Assistant: requires Windows and Internet access. 18 Windows Defender: Windows Defender Opt In, Windows 10, and internet connection required for updates. 19 HP PhoneWise: HP PhoneWise Client is only available on select platforms. For supported platforms and HP PhoneWise system requirements see www.hp.com/go/HPPhoneWise. 20 HP Sure Recover: is available on HP Elite PCs with 8th generation Intel® or AMD processors and requires an open, wired network connection. Not available on platforms with multiple internal storage drives, Intel® Optane™. You must back up important files, data, photos, videos, etc. before use to avoid loss of data. 21 HP Management Integration Kit for Microsoft System Center Configuration Management Gen 2: HP Manageability Integration Kit can be downloaded from http://www8.hp.com/us/en/ads/clientmanagement/overview.html 22 Ivanti Management Suite: subscription required. 23 HP Client Security Suite Gen 4: requires Windows and Intel® or AMD 8th generation processors. 24 HP Password Manager: requires Internet Explorer or Chrome or FireFox. Some websites and applications may not be supported. User may need to enable or allow the add-on / extension in the internet browser. 25 HP Sure Start Gen 4: is available on HP Elite and HP Pro 600 products equipped with 8th generation Intel® or AMD processors. 26 Trusted Platform Module TPM 2.0 Embedded Security Chip shipped with Windows 10 (Common Criteria EAL4+ Certified)(FIPS 140-2 Level 2 Certified): Firmware TPM is version 2.0. Hardware TPM is v1.2, which is a subset of the TPM 2.0 specification version v0.89 as implemented by Intel Platform Trust Technology (PTT). 27 RAID configurations: is optional and does require a second hard drive. 28 HP Sure Run: is available on HP Elite products equipped with 8th generation Intel® or AMD processors. 29 HP Drive Lock is not supported on NVMe drives. 30 AMD Ryzen™ PRO CPU requires discrete graphic card attached. 6 Multi-core is designed to improve performance of certain software products. Not all customers or software applications will necessarily benefit from use of this technology. Performance and clock frequency will vary depending on application workload and your hardware and software configurations. AMD’s numbering is not a measurement of clock speed. AMD and Radeon are trademarks of Advanced Micro Devices, Inc.
1 HP Sure Run is available on HP Elite products equipped with 8th generation Intel® or AMD processors. 2 HP Sure Recover is available on HP Elite PCs with 8th generation Intel® or AMD processors and requires an open, wired network connection. Not available on platforms with multiple internal drives or Intel® Optane™. You must back up important files, data, photos, videos, etc. before using HP Sure Recover to avoid loss of data. 3 HP Sure Click is available on most HP PCs and supports Microsoft® Internet Explorer and Chromium™. Supported attachments include Microsoft Office (Word, Excel, PowerPoint) and PDF files in read only mode, when Microsoft Office or Adobe Acrobat are installed. 4 Not all features are available in all editions or versions of Windows. Systems may require upgraded and/or separately purchased hardware, drivers, software or BIOS update to take full advantage of Windows functionality. Windows 10 is automatically updated, which is always enabled. ISP fees may apply and additional requirements may apply over time for updates. See http://www.windows.com. 5 Multi-Core is designed to improve performance of certain software products. Not all customers or software applications will necessarily benefit from use of this technology. Performance and clock frequency will vary depending on application workload and your hardware and software configurations. AMD’s numbering is not a measurement of clock speed. 6 Sold separately or as an optional feature. 7 Display sold separately. Requires HP B300 or B500 PC Mounting Bracket for Monitors, sold separately. See display QuickSpecs for bracket guidance. 8 Short USB-C™ cable included with PC configured with optional USB-C™ DisplayPort™ Alt-Mode port. 9 HP Sure Start Gen4 is available on HP Elite and HP Pro 600 products equipped with 8th generation Intel® or AMD processors. On AMD processors, only Intrusion Detection is supported. 10 HP Manageability Integration Kit can be downloaded from http://www.hp.com/go/clientmanagement. 1 Not all features are available in all editions or versions of Windows. Systems may require upgraded and/or separately purchased hardware, drivers, software or BIOS update to take full advantage of Windows functionality. Windows 10 is automatically updated, which is always enabled. ISP fees may apply and additional requirements may apply over time for updates. See http://www.windows.com/. 2 Some devices for academic use will automatically be updated to Windows 10 Pro Education with the Windows 10 Anniversary Update. Features vary; see https://aka.ms/ProEducation for Windows 10 Pro Education feature information. 3 Multi-core is designed to improve performance of certain software products. Not all customers or software applications will necessarily benefit from use of this technology. Performance and clock frequency will vary depending on application workload and your hardware and software configurations. AMD’s numbering is not a measurement of clock speed. 4 Native Miracast Support: is a wireless technology your PC can use to project your screen to TVs, projectors, and streaming. 5 HP Driver Packs: not preinstalled, however available for download at http://www.hp.com/go/clientmanagement 6 Multi-core is designed to improve performance of certain software products. Not all customers or software applications will necessarily benefit from use of this technology. Performance and clock frequency will vary depending on application workload and your hardware and software configurations. AMD’s numbering is not a measurement of clock speed. AMD and Radeon are trademarks of Advanced Micro Devices, Inc. 7 Burst frequency performance varies depending on hardware, software and overall system configuration. 8 NOTE: Your product does not support Windows 8 or Windows 7. In accordance with Microsoft’s support policy, HP does not support the Windows 8 or Windows 7 operating system on products configured with Intel® and AMD 7th generation and forward processors or provide any Windows 8 or Windows 7 drivers on http://www.support.hp.com 9 USB Antimicrobial Mouse: Not available in all regions; HP USB Hardened Mouse: Not available in all regions. 10 EPEAT® registered where applicable. EPEAT registration varies by country. See www.epeat.net for registration status by country. See HP’s 3rd party option store for solar energy accessory at www.hp.com/go/options. 11 External power supplies, power cords, cables and peripherals are not Low Halogen. Service parts obtained after purchase may not be Low Halogen. 12 Sold separately or as an optional feature. 13 (1) USB 3.1 Type-C™ Gen 2: Fast charging. 14 One 2.5" SATA HDD: Sold separately or as an optional feature. 15 HP Secure Erase: for the methods outlined in the National Institute of Standards and Technology Special Publication 800-88 "Clear" sanitation method. 16 Absolute Persistence module: Absolute agent is shipped turned off, and will be activated when customers activate a purchased subscription. Subscriptions can be purchased for terms ranging multiple years. Service is limited, check with Absolute for availability outside the U.S. The Absolute Recovery Guarantee is a limited warranty. Certain conditions apply. For full details visit: http://www.absolute.com/company/legal/agreements/computrace-agreement. Data Delete is an optional service provided by Absolute Software. If utilized, the Recovery Guarantee is null and void. In order to use the Data Delete service, customers must first sign a Pre-Authorization Agreement and either obtain a PIN or purchase one or more RSA SecurID tokens from Absolute Software. 17 HP Support Assistant: requires Windows and Internet access. 18 Windows Defender: Windows Defender Opt In, Windows 10, and internet connection required for updates. 19 HP PhoneWise: HP PhoneWise Client is only available on select platforms. For supported platforms and HP PhoneWise system requirements see www.hp.com/go/HPPhoneWise. 20 HP Sure Recover: is available on HP Elite PCs with 8th generation Intel® or AMD processors and requires an open, wired network connection. Not available on platforms with multiple internal storage drives, Intel® Optane™. You must back up important files, data, photos, videos, etc. before use to avoid loss of data. 21 HP Management Integration Kit for Microsoft System Center Configuration Management Gen 2: HP Manageability Integration Kit can be downloaded from http://www8.hp.com/us/en/ads/clientmanagement/overview.html 22 Ivanti Management Suite: subscription required. 23 HP Client Security Suite Gen 4: requires Windows and Intel® or AMD 8th generation processors. 24 HP Password Manager: requires Internet Explorer or Chrome or FireFox. Some websites and applications may not be supported. User may need to enable or allow the add-on / extension in the internet browser. 25 HP Sure Start Gen 4: is available on HP Elite and HP Pro 600 products equipped with 8th generation Intel® or AMD processors. 26 Trusted Platform Module TPM 2.0 Embedded Security Chip shipped with Windows 10 (Common Criteria EAL4+ Certified)(FIPS 140-2 Level 2 Certified): Firmware TPM is version 2.0. Hardware TPM is v1.2, which is a subset of the TPM 2.0 specification version v0.89 as implemented by Intel Platform Trust Technology (PTT). 27 RAID configurations: is optional and does require a second hard drive. 28 HP Sure Run: is available on HP Elite products equipped with 8th generation Intel® or AMD processors. 29 HP Drive Lock is not supported on NVMe drives. 30 AMD Ryzen™ PRO CPU requires discrete graphic card attached. 6 Multi-core is designed to improve performance of certain software products. Not all customers or software applications will necessarily benefit from use of this technology. Performance and clock frequency will vary depending on application workload and your hardware and software configurations. AMD’s numbering is not a measurement of clock speed. AMD and Radeon are trademarks of Advanced Micro Devices, Inc.
1 Not all features are available in all editions or versions of Windows. Systems may require upgraded and/or separately purchased hardware, drivers, software or BIOS update to take full advantage of Windows functionality. Windows 10 is automatically updated, which is always enabled. ISP fees may apply and additional requirements may apply over time for updates. See http://www.windows.com/. 2 Some devices for academic use will automatically be updated to Windows 10 Pro Education with the Windows 10 Anniversary Update. Features vary; see https://aka.ms/ProEducation for Windows 10 Pro Education feature information. 3 Multi-core is designed to improve performance of certain software products. Not all customers or software applications will necessarily benefit from use of this technology. Performance and clock frequency will vary depending on application workload and your hardware and software configurations. AMD’s numbering is not a measurement of clock speed. 4 Native Miracast Support: is a wireless technology your PC can use to project your screen to TVs, projectors, and streaming. 5 HP Driver Packs: not preinstalled, however available for download at http://www.hp.com/go/clientmanagement 6 HP BIOSphere: HP BIOSphere Gen4 requires Intel® or AMD 8th Gen processors. Features may vary depending on the platform and configurations. 7 For hard drives and solid state drives, GB = 1 billion bytes. TB = 1 trillion bytes. Actual formatted capacity is less. Up to 36 GB (for Windows 10) of system disk is reserved for the system recovery software. 8 NOTE: Your product does not support Windows 8 or Windows 7. In accordance with Microsoft’s support policy, HP does not support the Windows 8 or Windows 7 operating system on products configured with Intel® and AMD 7th generation and forward processors or provide any Windows 8 or Windows 7 drivers on http://www.support.hp.com 9 USB Antimicrobial Mouse: Not available in all regions; HP USB Hardened Mouse: Not available in all regions. 10 EPEAT® registered where applicable. EPEAT registration varies by country. See www.epeat.net for registration status by country. See HP’s 3rd party option store for solar energy accessory at www.hp.com/go/options. 11 External power supplies, power cords, cables and peripherals are not Low Halogen. Service parts obtained after purchase may not be Low Halogen. 12 Sold separately or as an optional feature. 13 (1) USB 3.1 Type-C™ Gen 2: Fast charging. 14 One 2.5" SATA HDD: Sold separately or as an optional feature. 15 150 W external power adapter, up to 89% efficiency, active PFC: when ordered with a discrete graphics card. 16 HP Secure Erase: for the methods outlined in the National Institute of Standards and Technology Special Publication 800-88 "Clear" sanitation method. 17 Absolute Persistence module: Absolute agent is shipped turned off, and will be activated when customers activate a purchased subscription. Subscriptions can be purchased for terms ranging multiple years. Service is limited, check with Absolute for availability outside the U.S. The Absolute Recovery Guarantee is a limited warranty. Certain conditions apply. For full details visit: http://www.absolute.com/company/legal/agreements/computrace-agreement. Data Delete is an optional service provided by Absolute Software. If utilized, the Recovery Guarantee is null and void. In order to use the Data Delete service, customers must first sign a Pre-Authorization Agreement and either obtain a PIN or purchase one or more RSA SecurID tokens from Absolute Software. 18 HP ePrint Driver + JetAdvantage: requires an Internet connection to HP web-enabled printer and HP ePrint account registration (for a list of eligible printers, supported documents and image types and other HP ePrint details, see www.hp.com/go/eprintcenter). Print times and connection speeds may vary. 19 HP Support Assistant: requires Windows and Internet access. 20 Windows Defender: Windows Defender Opt In, Windows 10, and internet connection required for updates. 21 HP PhoneWise: HP PhoneWise Client is only available on select platforms. For supported platforms and HP PhoneWise system requirements see www.hp.com/go/HPPhoneWise. 22 HP Sure Recover: is available on HP Elite PCs with 8th generation Intel® or AMD processors and requires an open, wired network connection. Not available on platforms with multiple internal storage drives, Intel® Optane™. You must back up important files, data, photos, videos, etc. before use to avoid loss of data. 23 HP Management Integration Kit for Microsoft System Center Configuration Management Gen 2: HP Manageability Integration Kit can be downloaded from http://www8.hp.com/us/en/ads/clientmanagement/overview.html 24 Ivanti Management Suite: subscription required. 25 HP Client Security Suite Gen 4: requires Windows and Intel® or AMD 8th generation processors. 26 HP Password Manager: requires Internet Explorer or Chrome or FireFox. Some websites and applications may not be supported. User may need to enable or allow the add-on / extension in the internet browser. 27 HP Sure Start Gen 4: is available on HP Elite and HP Pro 600 products equipped with 8th generation Intel® or AMD processors. 28 Trusted Platform Module TPM 2.0 Embedded Security Chip shipped with Windows 10 (Common Criteria EAL4+ Certified)(FIPS 140-2 Level 2 Certified): Firmware TPM is version 2.0. Hardware TPM is v1.2, which is a subset of the TPM 2.0 specification version v0.89 as implemented by Intel Platform Trust Technology (PTT). 29 RAID configurations: is optional and does require a second hard drive. 30 HP Sure Run: is available on HP Elite products equipped with 8th generation Intel® or AMD processors. 31 HP Drive Lock is not supported on NVMe drives. 32 AMD Ryzen™ PRO CPU requires discrete graphic card attached. 1 HP Sure Run is available on HP Elite products equipped with 8th generation Intel® or AMD processors. 2 HP Sure Recover is available on HP Elite PCs with 8th generation Intel® or AMD processors and requires an open, wired network connection. Not available on platforms with multiple internal drives or Intel® Optane™. You must back up important files, data, photos, videos, etc. before using HP Sure Recover to avoid loss of data. 3 HP Sure Click is available on most HP PCs and supports Microsoft® Internet Explorer and Chromium™. Supported attachments include Microsoft Office (Word, Excel, PowerPoint) and PDF files in read only mode, when Microsoft Office or Adobe Acrobat are installed. 4 Not all features are available in all editions or versions of Windows. Systems may require upgraded and/or separately purchased hardware, drivers, software or BIOS update to take full advantage of Windows functionality. Windows 10 is automatically updated, which is always enabled. ISP fees may apply and additional requirements may apply over time for updates. See http://www.windows.com. 5 Multi-Core is designed to improve performance of certain software products. Not all customers or software applications will necessarily benefit from use of this technology. Performance and clock frequency will vary depending on application workload and your hardware and software configurations. AMD’s numbering is not a measurement of clock speed. 6 Sold separately or as an optional feature. 7 Display sold separately. Requires HP B300 or B500 PC Mounting Bracket for Monitors, sold separately. See display QuickSpecs for bracket guidance. 8 Short USB-C™ cable included with PC configured with optional USB-C™ DisplayPort™ Alt-Mode port. 9 HP Sure Start Gen4 is available on HP Elite and HP Pro 600 products equipped with 8th generation Intel® or AMD processors. On AMD processors, only Intrusion Detection is supported. 10 HP Manageability Integration Kit can be downloaded from http://www.hp.com/go/clientmanagement. 1 Not all features are available in all editions or versions of Windows. Systems may require upgraded and/or separately purchased hardware, drivers, software or BIOS update to take full advantage of Windows functionality. Windows 10 is automatically updated, which is always enabled. ISP fees may apply and additional requirements may apply over time for updates. See http://www.windows.com/. 2 Some devices for academic use will automatically be updated to Windows 10 Pro Education with the Windows 10 Anniversary Update. Features vary; see https://aka.ms/ProEducation for Windows 10 Pro Education feature information. 3 Multi-core is designed to improve performance of certain software products. Not all customers or software applications will necessarily benefit from use of this technology. Performance and clock frequency will vary depending on application workload and your hardware and software configurations. AMD’s numbering is not a measurement of clock speed. 4 Native Miracast Support: is a wireless technology your PC can use to project your screen to TVs, projectors, and streaming. 5 HP Driver Packs: not preinstalled, however available for download at http://www.hp.com/go/clientmanagement 6 HP BIOSphere: HP BIOSphere Gen4 requires Intel® or AMD 8th Gen processors. Features may vary depending on the platform and configurations. 7 For hard drives and solid state drives, GB = 1 billion bytes. TB = 1 trillion bytes. Actual formatted capacity is less. Up to 36 GB (for Windows 10) of system disk is reserved for the system recovery software. 8 NOTE: Your product does not support Windows 8 or Windows 7. In accordance with Microsoft’s support policy, HP does not support the Windows 8 or Windows 7 operating system on products configured with Intel® and AMD 7th generation and forward processors or provide any Windows 8 or Windows 7 drivers on http://www.support.hp.com 9 USB Antimicrobial Mouse: Not available in all regions; HP USB Hardened Mouse: Not available in all regions. 10 EPEAT® registered where applicable. EPEAT registration varies by country. See www.epeat.net for registration status by country. See HP’s 3rd party option store for solar energy accessory at www.hp.com/go/options. 11 External power supplies, power cords, cables and peripherals are not Low Halogen. Service parts obtained after purchase may not be Low Halogen. 12 Sold separately or as an optional feature. 13 (1) USB 3.1 Type-C™ Gen 2: Fast charging. 14 One 2.5" SATA HDD: Sold separately or as an optional feature. 15 150 W external power adapter, up to 89% efficiency, active PFC: when ordered with a discrete graphics card. 16 HP Secure Erase: for the methods outlined in the National Institute of Standards and Technology Special Publication 800-88 "Clear" sanitation method. 17 Absolute Persistence module: Absolute agent is shipped turned off, and will be activated when customers activate a purchased subscription. Subscriptions can be purchased for terms ranging multiple years. Service is limited, check with Absolute for availability outside the U.S. The Absolute Recovery Guarantee is a limited warranty. Certain conditions apply. For full details visit: http://www.absolute.com/company/legal/agreements/computrace-agreement. Data Delete is an optional service provided by Absolute Software. If utilized, the Recovery Guarantee is null and void. In order to use the Data Delete service, customers must first sign a Pre-Authorization Agreement and either obtain a PIN or purchase one or more RSA SecurID tokens from Absolute Software. 18 HP ePrint Driver + JetAdvantage: requires an Internet connection to HP web-enabled printer and HP ePrint account registration (for a list of eligible printers, supported documents and image types and other HP ePrint details, see www.hp.com/go/eprintcenter). Print times and connection speeds may vary. 19 HP Support Assistant: requires Windows and Internet access. 20 Windows Defender: Windows Defender Opt In, Windows 10, and internet connection required for updates. 21 HP PhoneWise: HP PhoneWise Client is only available on select platforms. For supported platforms and HP PhoneWise system requirements see www.hp.com/go/HPPhoneWise. 22 HP Sure Recover: is available on HP Elite PCs with 8th generation Intel® or AMD processors and requires an open, wired network connection. Not available on platforms with multiple internal storage drives, Intel® Optane™. You must back up important files, data, photos, videos, etc. before use to avoid loss of data. 23 HP Management Integration Kit for Microsoft System Center Configuration Management Gen 2: HP Manageability Integration Kit can be downloaded from http://www8.hp.com/us/en/ads/clientmanagement/overview.html 24 Ivanti Management Suite: subscription required. 25 HP Client Security Suite Gen 4: requires Windows and Intel® or AMD 8th generation processors. 26 HP Password Manager: requires Internet Explorer or Chrome or FireFox. Some websites and applications may not be supported. User may need to enable or allow the add-on / extension in the internet browser. 27 HP Sure Start Gen 4: is available on HP Elite and HP Pro 600 products equipped with 8th generation Intel® or AMD processors. 28 Trusted Platform Module TPM 2.0 Embedded Security Chip shipped with Windows 10 (Common Criteria EAL4+ Certified)(FIPS 140-2 Level 2 Certified): Firmware TPM is version 2.0. Hardware TPM is v1.2, which is a subset of the TPM 2.0 specification version v0.89 as implemented by Intel Platform Trust Technology (PTT). 29 RAID configurations: is optional and does require a second hard drive. 30 HP Sure Run: is available on HP Elite products equipped with 8th generation Intel® or AMD processors. 31 HP Drive Lock is not supported on NVMe drives. 32 AMD Ryzen™ PRO CPU requires discrete graphic card attached. 1 HP Sure Run is available on HP Elite products equipped with 8th generation Intel® or AMD processors. 2 HP Sure Recover is available on HP Elite PCs with 8th generation Intel® or AMD processors and requires an open, wired network connection. Not available on platforms with multiple internal drives or Intel® Optane™. You must back up important files, data, photos, videos, etc. before using HP Sure Recover to avoid loss of data. 3 HP Sure Click is available on most HP PCs and supports Microsoft® Internet Explorer and Chromium™. Supported attachments include Microsoft Office (Word, Excel, PowerPoint) and PDF files in read only mode, when Microsoft Office or Adobe Acrobat are installed. 4 Not all features are available in all editions or versions of Windows. Systems may require upgraded and/or separately purchased hardware, drivers, software or BIOS update to take full advantage of Windows functionality. Windows 10 is automatically updated, which is always enabled. ISP fees may apply and additional requirements may apply over time for updates. See http://www.windows.com. 5 Multi-Core is designed to improve performance of certain software products. Not all customers or software applications will necessarily benefit from use of this technology. Performance and clock frequency will vary depending on application workload and your hardware and software configurations. AMD’s numbering is not a measurement of clock speed. 6 Sold separately or as an optional feature. 7 Display sold separately. Requires HP B300 or B500 PC Mounting Bracket for Monitors, sold separately. See display QuickSpecs for bracket guidance. 8 Short USB-C™ cable included with PC configured with optional USB-C™ DisplayPort™ Alt-Mode port. 9 HP Sure Start Gen4 is available on HP Elite and HP Pro 600 products equipped with 8th generation Intel® or AMD processors. On AMD processors, only Intrusion Detection is supported. 10 HP Manageability Integration Kit can be downloaded from http://www.hp.com/go/clientmanagement. 1 Not all features are available in all editions or versions of Windows. Systems may require upgraded and/or separately purchased hardware, drivers, software or BIOS update to take full advantage of Windows functionality. Windows 10 is automatically updated, which is always enabled. ISP fees may apply and additional requirements may apply over time for updates. See http://www.windows.com/. 2 Some devices for academic use will automatically be updated to Windows 10 Pro Education with the Windows 10 Anniversary Update. Features vary; see https://aka.ms/ProEducation for Windows 10 Pro Education feature information. 3 Multi-core is designed to improve performance of certain software products. Not all customers or software applications will necessarily benefit from use of this technology. Performance and clock frequency will vary depending on application workload and your hardware and software configurations. AMD’s numbering is not a measurement of clock speed. 4 Native Miracast Support: is a wireless technology your PC can use to project your screen to TVs, projectors, and streaming. 5 HP Driver Packs: not preinstalled, however available for download at http://www.hp.com/go/clientmanagement 6 HP BIOSphere: HP BIOSphere Gen4 requires Intel® or AMD 8th Gen processors. Features may vary depending on the platform and configurations. 7 For hard drives and solid state drives, GB = 1 billion bytes. TB = 1 trillion bytes. Actual formatted capacity is less. Up to 36 GB (for Windows 10) of system disk is reserved for the system recovery software. 8 NOTE: Your product does not support Windows 8 or Windows 7. In accordance with Microsoft’s support policy, HP does not support the Windows 8 or Windows 7 operating system on products configured with Intel® and AMD 7th generation and forward processors or provide any Windows 8 or Windows 7 drivers on http://www.support.hp.com 9 USB Antimicrobial Mouse: Not available in all regions; HP USB Hardened Mouse: Not available in all regions. 10 EPEAT® registered where applicable. EPEAT registration varies by country. See www.epeat.net for registration status by country. See HP’s 3rd party option store for solar energy accessory at www.hp.com/go/options. 11 External power supplies, power cords, cables and peripherals are not Low Halogen. Service parts obtained after purchase may not be Low Halogen. 12 Sold separately or as an optional feature. 13 (1) USB 3.1 Type-C™ Gen 2: Fast charging. 14 One 2.5" SATA HDD: Sold separately or as an optional feature. 15 150 W external power adapter, up to 89% efficiency, active PFC: when ordered with a discrete graphics card. 16 HP Secure Erase: for the methods outlined in the National Institute of Standards and Technology Special Publication 800-88 "Clear" sanitation method. 17 Absolute Persistence module: Absolute agent is shipped turned off, and will be activated when customers activate a purchased subscription. Subscriptions can be purchased for terms ranging multiple years. Service is limited, check with Absolute for availability outside the U.S. The Absolute Recovery Guarantee is a limited warranty. Certain conditions apply. For full details visit: http://www.absolute.com/company/legal/agreements/computrace-agreement. Data Delete is an optional service provided by Absolute Software. If utilized, the Recovery Guarantee is null and void. In order to use the Data Delete service, customers must first sign a Pre-Authorization Agreement and either obtain a PIN or purchase one or more RSA SecurID tokens from Absolute Software. 18 HP ePrint Driver + JetAdvantage: requires an Internet connection to HP web-enabled printer and HP ePrint account registration (for a list of eligible printers, supported documents and image types and other HP ePrint details, see www.hp.com/go/eprintcenter). Print times and connection speeds may vary. 19 HP Support Assistant: requires Windows and Internet access. 20 Windows Defender: Windows Defender Opt In, Windows 10, and internet connection required for updates. 21 HP PhoneWise: HP PhoneWise Client is only available on select platforms. For supported platforms and HP PhoneWise system requirements see www.hp.com/go/HPPhoneWise. 22 HP Sure Recover: is available on HP Elite PCs with 8th generation Intel® or AMD processors and requires an open, wired network connection. Not available on platforms with multiple internal storage drives, Intel® Optane™. You must back up important files, data, photos, videos, etc. before use to avoid loss of data. 23 HP Recovery Manager: available for a limited time on certain models. 24 HP Management Integration Kit for Microsoft System Center Configuration Management Gen 2: HP Manageability Integration Kit can be downloaded from http://www8.hp.com/us/en/ads/clientmanagement/overview.html 25 Ivanti Management Suite: subscription required. 26 HP Client Security Suite Gen 4: requires Windows and Intel® or AMD 8th generation processors. 27 HP Password Manager: requires Internet Explorer or Chrome or FireFox. Some websites and applications may not be supported. User may need to enable or allow the add-on / extension in the internet browser. 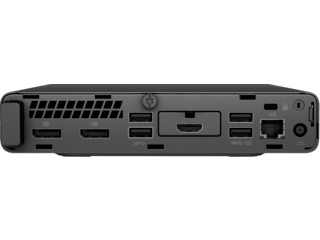 28 HP Sure Start Gen 4: is available on HP Elite and HP Pro 600 products equipped with 8th generation Intel® or AMD processors. 29 Trusted Platform Module TPM 2.0 Embedded Security Chip shipped with Windows 10 (Common Criteria EAL4+ Certified)(FIPS 140-2 Level 2 Certified): Firmware TPM is version 2.0. Hardware TPM is v1.2, which is a subset of the TPM 2.0 specification version v0.89 as implemented by Intel Platform Trust Technology (PTT). 30 RAID configurations: is optional and does require a second hard drive. 31 HP Sure Run: is available on HP Elite products equipped with 8th generation Intel® or AMD processors. 32 HP Drive Lock is not supported on NVMe drives. 33 AMD Ryzen™ PRO CPU requires discrete graphic card attached. 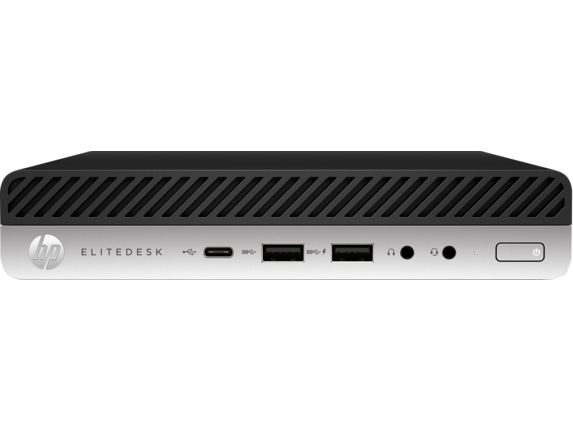 The HP EliteDesk 705 Desktop Mini is more than just the world’s smallest business class mini desktop computer—it’s the solution to whatever work is thrown your way. Designed with compact measurements (7in x 6.9in x 1.3in) and custom mounting options, the EliteDesk 705 can rest horizontally or vertically when mounted on its slim pedestal. Want it in a more discrete location? Simply slip it in a drawer or set it up to stand out of the way, and you’re ready to go. Does your office feel bogged down by clutter or are you just completely set on avoiding it? The HP EliteDesk line is so lightweight and so unobtrusive that it can be secured to the back of VESA compatible displays using built-in flexible mounting options. This lets you fight clutter before it happens, while allowing you to master your workspace. As a line, the HP EliteDesk Desktop Mini series offers outsized functionality at an undersized price. And for unparalleled performance and efficiency, simply pair it with an HP business desktop display to get the most out of your space. The most important customization options for your desktop may end when you find the perfect out-of-the-way spot for it in your office, but they don’t have to. The HP EliteDesk 705 Desktop Mini is the epitome of a space-saving device, because it’s designed to both minimize and maximize any area it occupies. Start with our base HP EliteDesk 705 G3 Desktop Mini, equipped with AMD PRO A-Series APUs and Radeon™ graphics. Those features come alongside a minimum 4GB of memory and 500GB of SED HDD storage. If that’s not enough, you can then take your pick from a huge range of processor and graphics card options. Upgrade your memory to as much as 32GB of DDR4 memory or swap in the flexibility of 512GB SSD storage. You can even customize your own port configurations from a combination of HDMI and/or DisplayPorts to get the most out of your current display solution or any you’re preparing to acquire in the near future. The point here is simple: Synchronize and adapt your specs to however your office works. Need to set the bar high for both performance and design? We’ve got you covered there, too. If you want an option that perfectly fits into the modern workplace, you’ll want to focus your attention on the HP ProDesk 600 Desktop Mini or the even more versatile HP EliteDesk 800 Desktop Mini. It’s still the world’s smallest business class mini, but it comes with a loadout and exterior design that truly stands out. 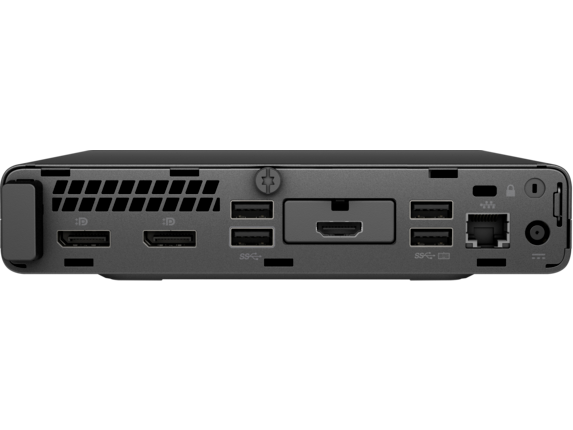 Boasting a 7th Generation Intel® Core™ i5 processor and sporting a stylish materials update, the ProDesk 600 also offers the same extensive customization options available with HP’s mini desktop range. You’ll even be able to manage devices with the power of HP’s Manageability Integration Kit. Want the absolute most in design and options for access and performance? 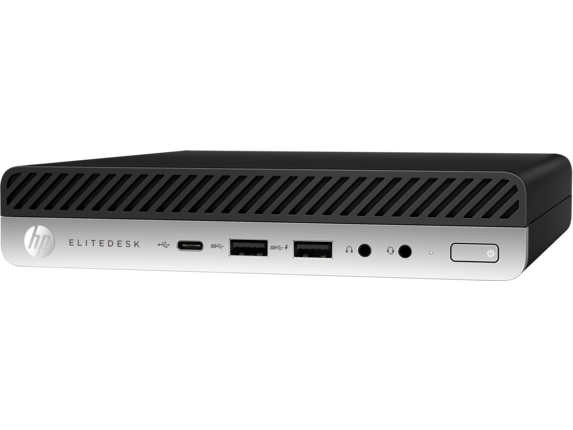 The HP EliteDesk 800 Desktop Mini is definitely for you. Built with deeper security and management features, you can go all out with options, such as adding Intel® Optane™ memory or HP Turbo Drive. While HP’s mini desktop computers may provide a lot of power in a smaller package, you can rest easy knowing they’re always secure. Our minis come bolstered by features like HP BIOSphere with Sure Start, which automatically detects and protects against attacks or file corruption. In addition to being concerned about security issues, you know it can be easy for the electric bill to get out of hand when your goal is expanding capacity at the office. That goes for whether you’re building up a new venture or simply upgrading from an older technology suite. Cut the bills and reduce your office’s environmental footprint with a desktop you never have to worry about. 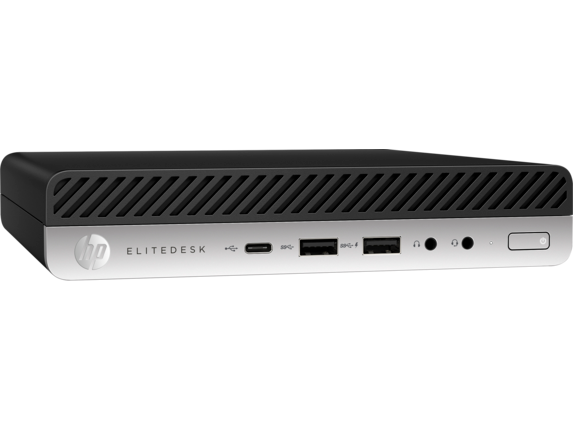 HP’s EliteDesk and ProDesk mini desktop computers are all Energy Star® and EPEAT® certified, with power configurations that idle at levels as low as 8W.